SUMMARY: Originally posted on Facebook (and ongoing); reposted here for posterity and those who aren't on FB. 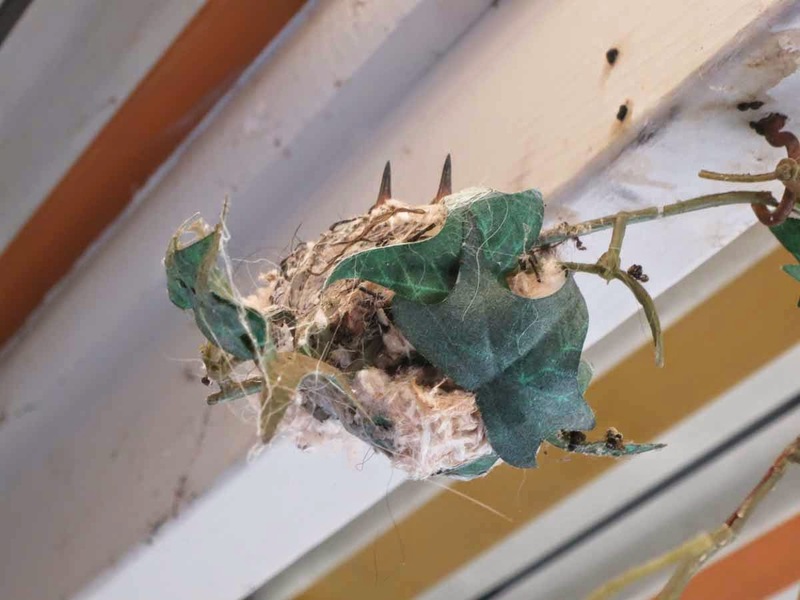 I guess that I shouldn't fret so much over my hummingbird. I mean, if she weren't living on my porch, I'd never know one way or the other what happened to her. 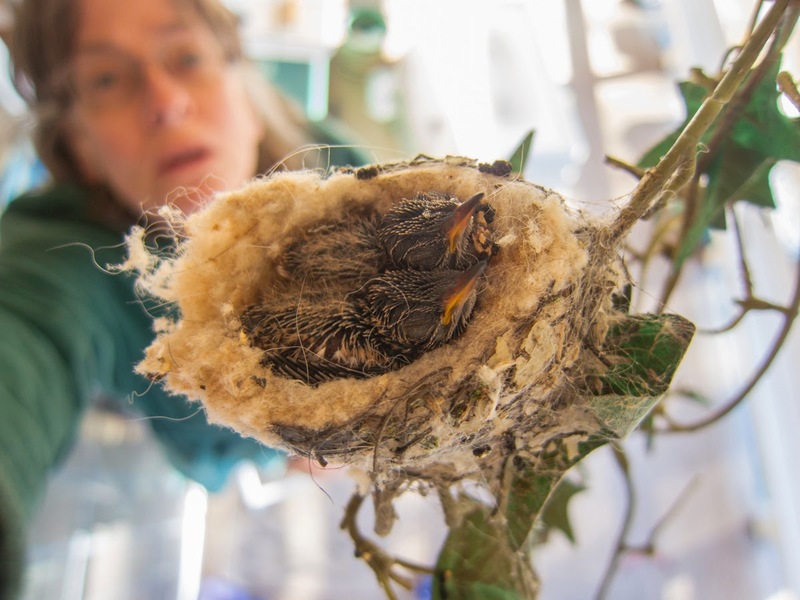 But her nest last year blew over twice on the decorations on which she built it,and then she gave up. She moved over a couple of feet, but it's on a precarious end of a wire and it's sooooo windy out there..... Fret fret fret even though really there's nothing I can do about it. I did so enjoy watching her 2 previous years worth of twins grow up. Struggling with a hummingbird possible tragedy. 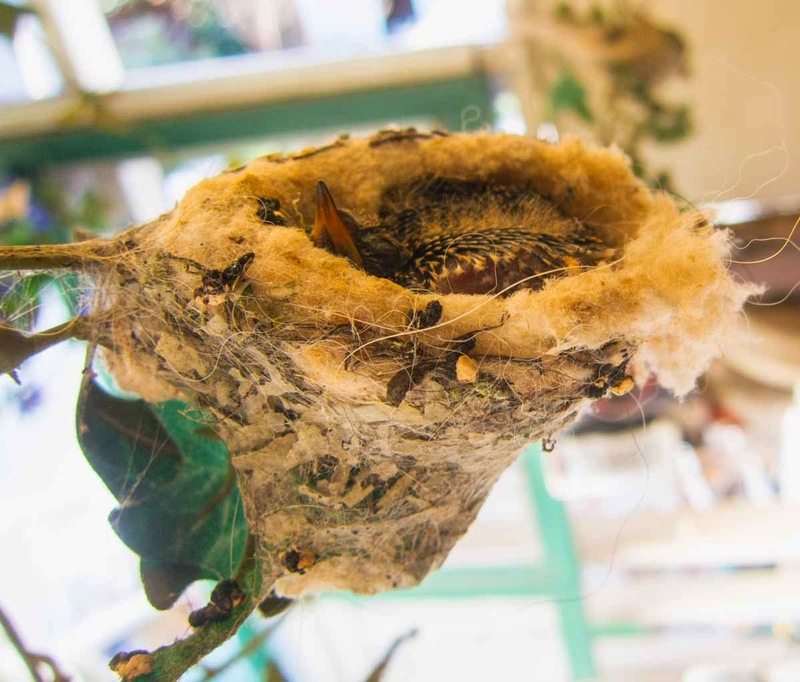 I've been so worried about the hummingbird nest--so windy and it's been looking as if it's tilting slightly. 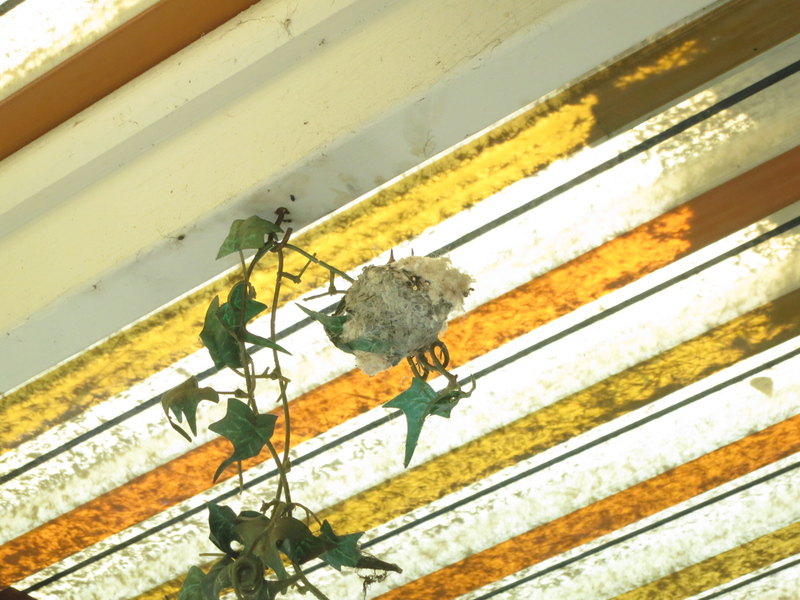 When I first came downstairs this morning, I looked out at the nest. Mama hummer not there, but not unusual for her to go look for food. I happened to glance down and there was a tiny piece of something on the carpet underneath--I bent down, and it was a baby! Crap! I touched it gently and it moved--still alive! It was very hard to pick it up (and it struggled in its very tiny underdeveloped way) as it has very long, thin claws that had become tangled in the carpet fiber (and this is a very flat, tightly woven outdoor carpet). I was afraid I'd break something so I was as gentle as possible. We're talking a baby who's just about the size of a finger joint and delicate talons thinner than a hair! Oh em gee-- I really should just let things go their own way and not worry so much. Remember I said yesterday that the tiny tiny thing that I held in my hand looked like it nearly filled the nest? 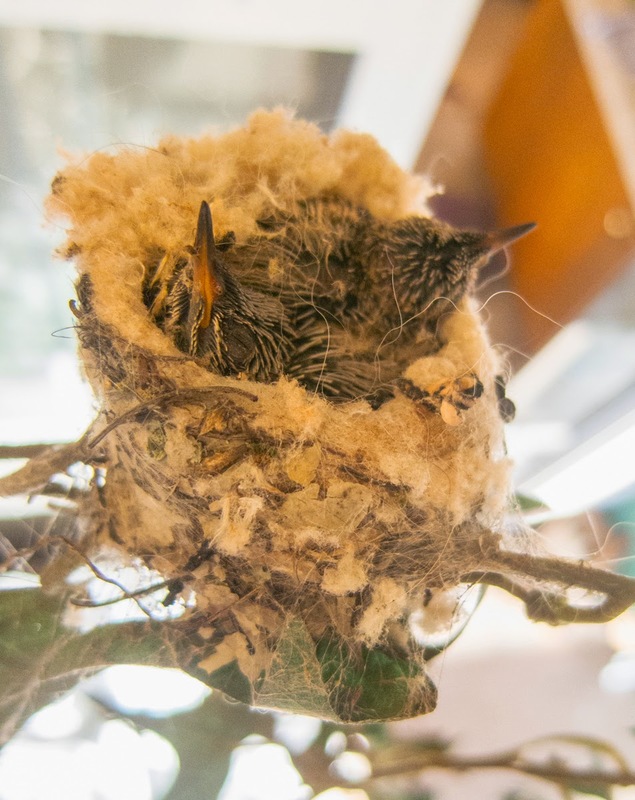 Well, I forgot this one thing about hummingbird mamas: Once the chicks get to a certain size, she no longer needs to sleep there to keep them warm and won't fit anyway! So apparently the little guy fell out at just that point in his life. He is alive and well this morning! I'm still not entirely sure what's going on--is there another chick in there under him somehow? what's the bare spot on the lower right--can't tell what body part I'm looking at there. The feathers don't seem to be going in the right direction for him. And as I've also noted there have always been twins before. Well, if there were twins and one is still there, I'd say that it's a goner. I don't THINK there is, but I can't make out what's visible here. 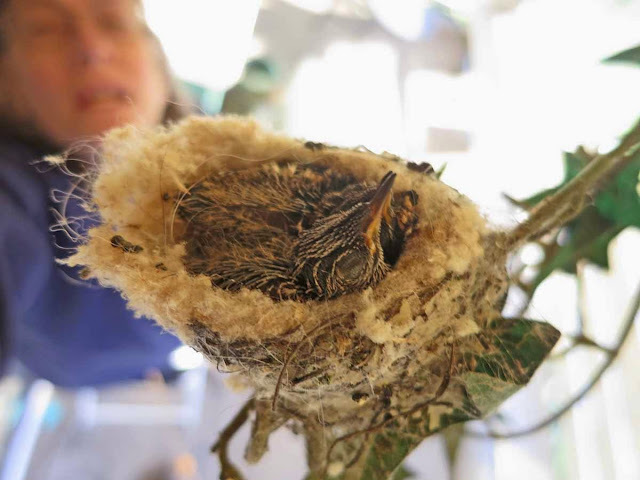 But, anyway, here you go--a hummingbird chick that's just a bit more than the size of my finger joint and growing like crazy daily. Hummer twins! All is right with the world! This is what I can see from below--two little bills pointed upward, waiting for mama hummer. 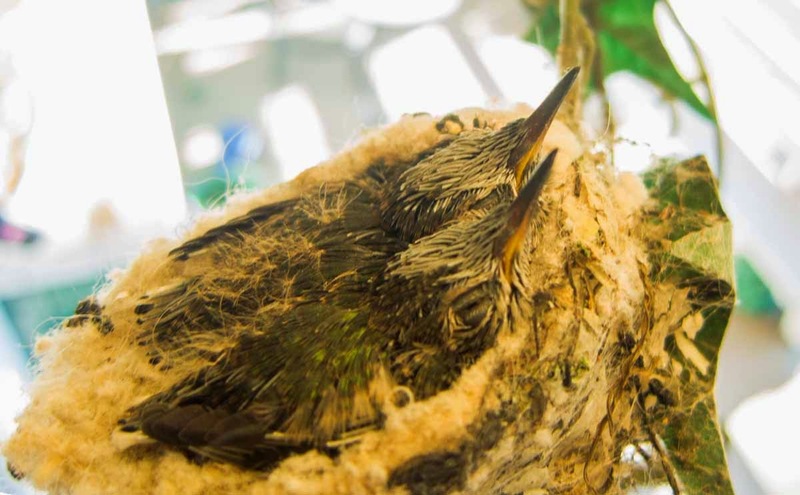 This is this morning's photo--2 babies hanging out in their slightly tilted nest. 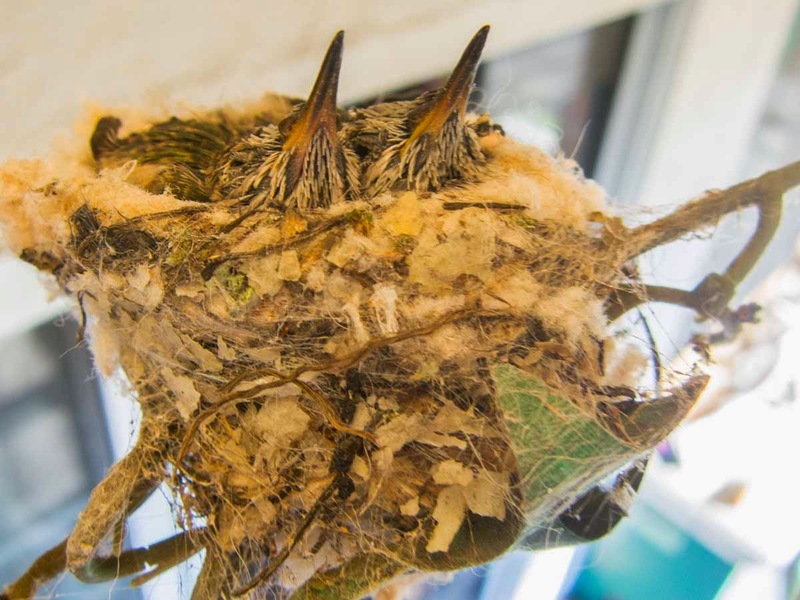 People asked about their size.You can see how the nest is listing to starboard. Hummer update: For those watching this soap opera, I really do have to warn you that this might not turn out happily. 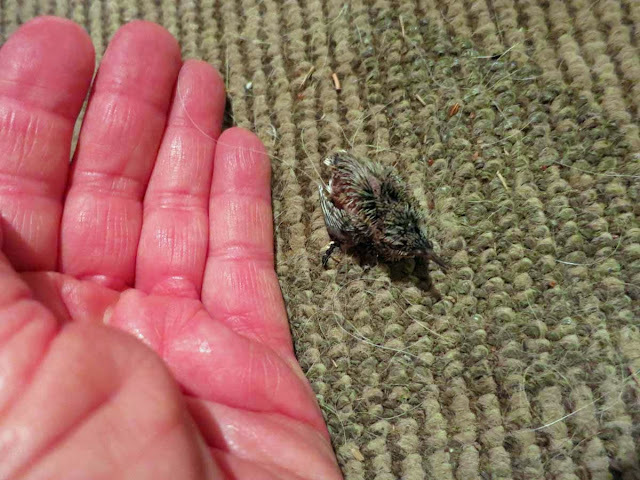 Thursday evening, Feb 12, just got home, and *&*@#, one of the babies is on the carpet again! Yes, again one has fallen out of the nest. Again I have to disentangle his tiny fragile claws from the carpet, and this time he's struggling mightily, too. I don't know whether I've hurt one of his feet as he struggles. 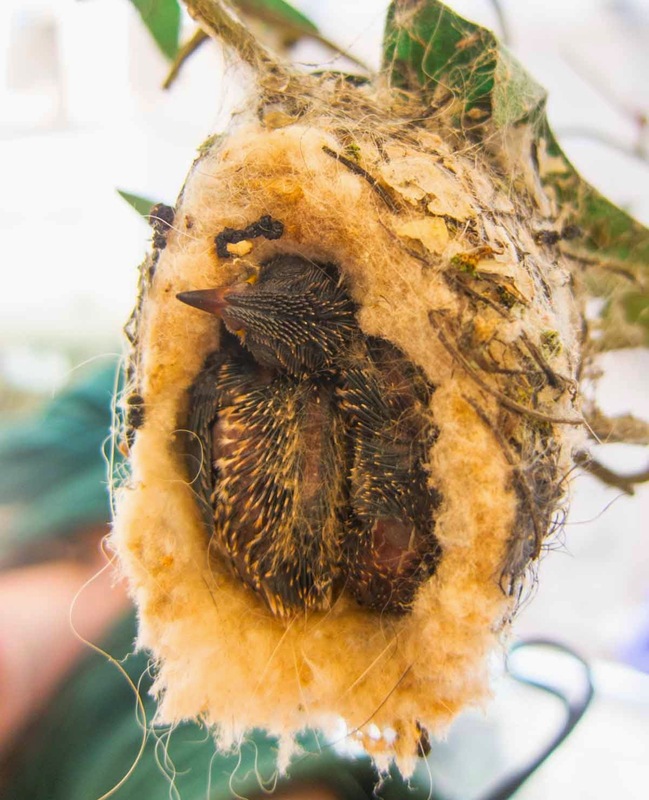 I gently dump him into the nest from my cupped palm, and he starts to fall out again. I catch him and then I ever ever so gently try to hold him upright between my fingers to drop him in feet first, and he lets out a tiny fragile high-pitched squeak, which I've not heard from the babies before. Oh, lord, I hope that I didn't kill him--their bones are so tiny and fragile! But he's in the nest, gasping for breath from the terror and hopefully not from pain. Then I did some rebending of the wire near the nest again, trying to get it straight--and SO scared I'm going to break the wire. An hour later, still seems to be in the nest. But I can't check them all the time--so I fear for the worst long-term. Friday morning--two chicks still in nest but apparently aren't speaking to each other. Scary--now I'm leaving town for 3 days. 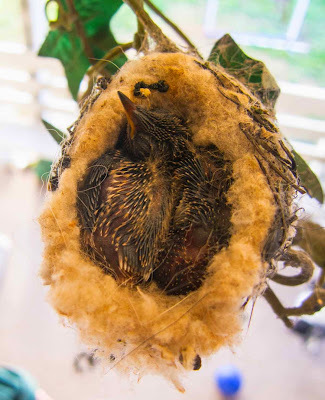 Who will check for babies falling out of the nest while I'm gone? No one. Sigh. 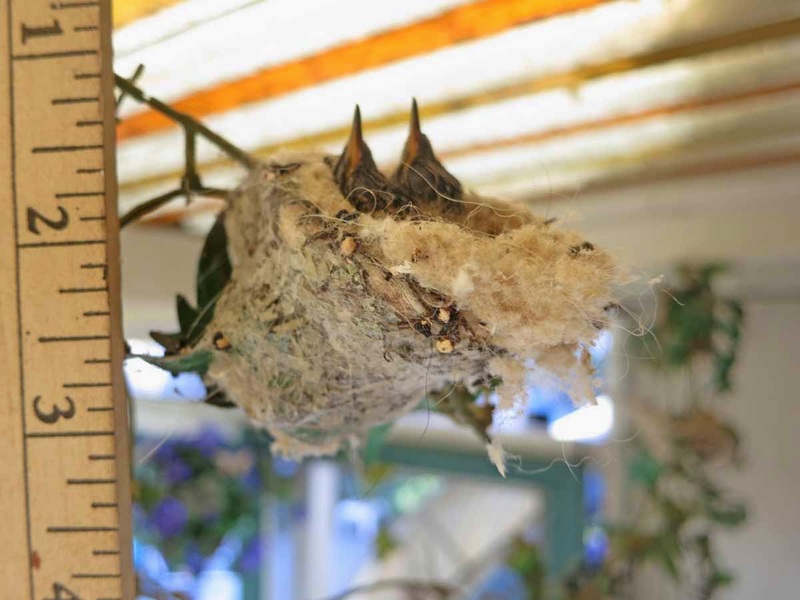 The latest drama from Twin Beaks--The Hummingbird Saga: I left town for 3 days, and what a delight to look up this morning at home and see this!